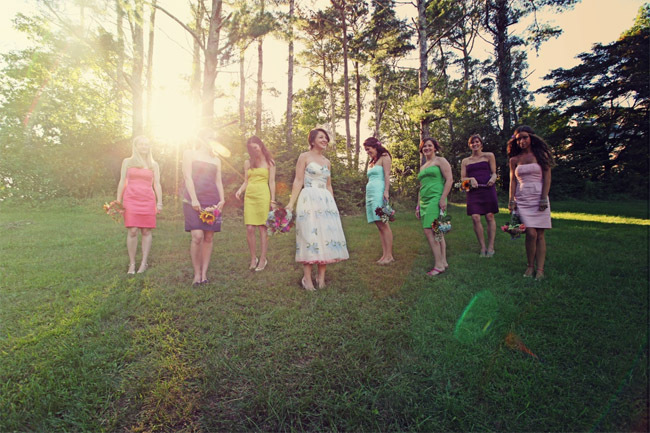 We’ve been fans of mismatched bridesmaid dresses for a long time, so we are absolutely in love with this idea that takes mismatched dresses a step further – outfit each of your bridesmaids in a different color of the rainbow! If done right, this look can be pretty darn fabulous and it’s great for those who have trouble pinning down a specific color scheme. Not to mention, rainbows are a sign of hope and promise, so the symbolism is super sweet too! 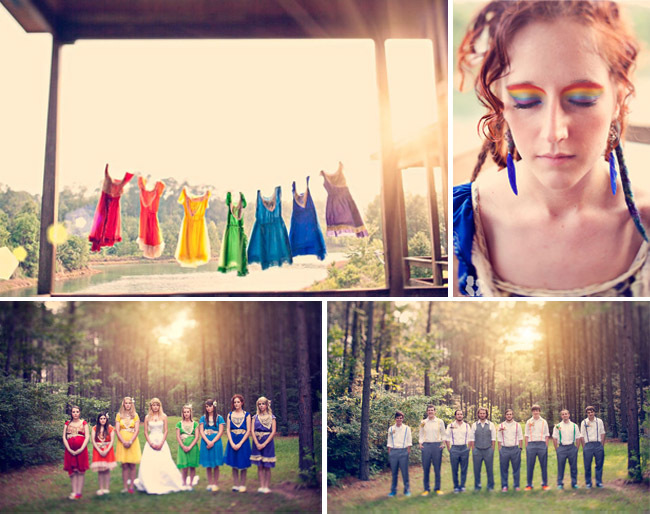 If you are a little bit of an off-beat bride yourself, here are some rainbow attire examples to inspire you. 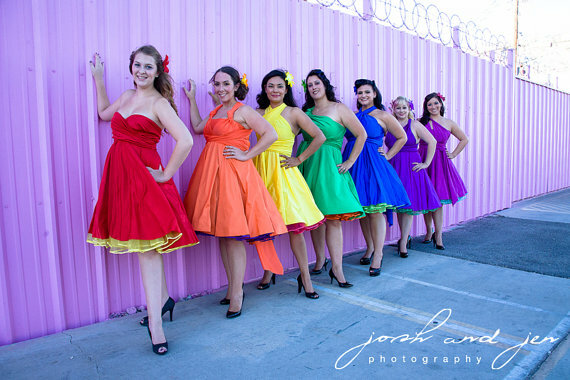 Here’s another super cute bridal party rocking the rainbow look. As you can see, it still looks cohesive even if all the dresses are a different style. This makes it really easy for your ladies to go shopping for a dress–just give them a paint swatch with their color and let them pick out a dress they love and will wear again! You can definitely pull off the mismatched look like the wedding party above. 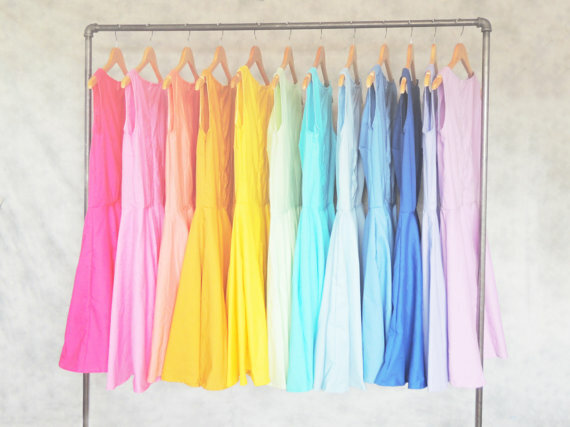 However, if you are looking for a little more uniformity between your ladies, a great place to start looking for rainbow colored bridesmaids dresses is Dessy. 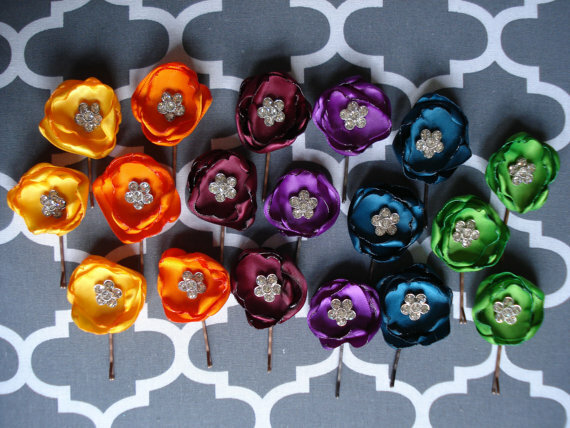 They have nearly 200 color options and they let you mix and match bridesmaid styles from all of their collections, meaning you can create the perfect matching rainbow look! 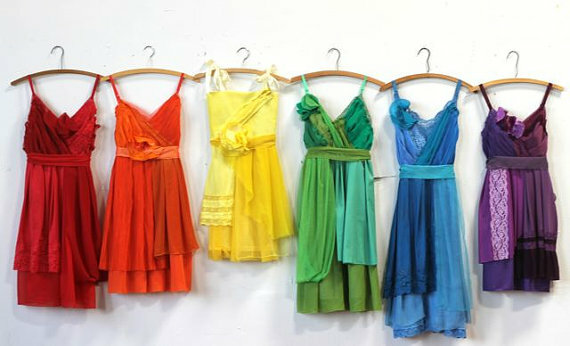 Etsy has some great dress designers who offer bridesmaids dresses in all shades of the rainbow. 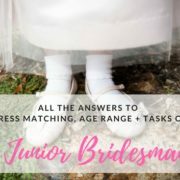 Check out the following talented designers who will hand-make all your rainbow bridesmaids dresses from scratch. When it comes to a perfectly colored rainbow palette, you can’t forget about matching accessories. 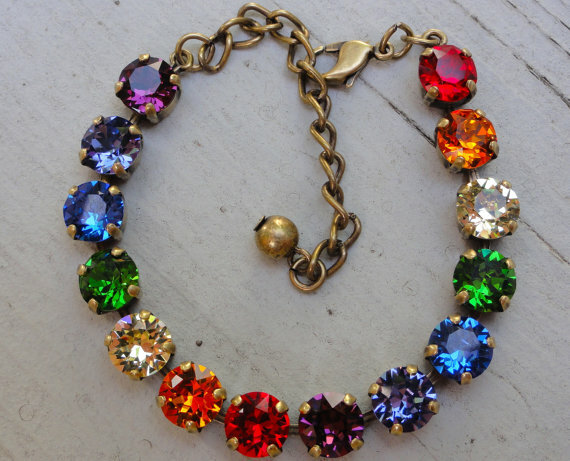 Have some fun, and give these rainbow colored accessories a go. As this fun bridal party shows, there’s no need to fret if you have more than seven maids–just add in a couple different shades of each color! Include the guys in the color scheme by letting them wear different colored ties to match. 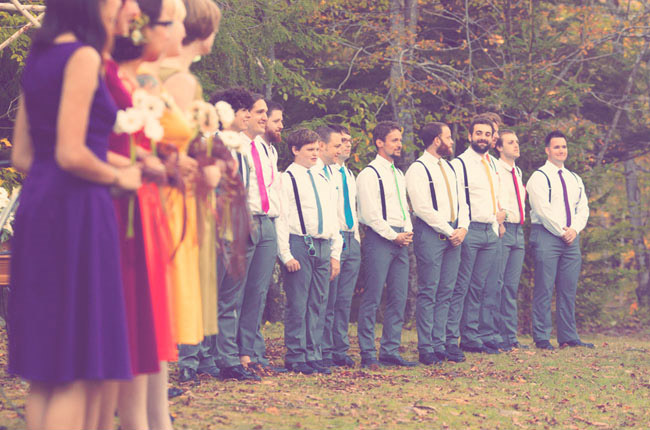 This wedding might just be our favorite rainbow wedding yet! The bridesmaids took it to the next level by wearing rainbow eye shadow. Plus, how cute are all the dresses hanging?? The guys wore different rainbow suspenders and shoes to match! If the idea of going totally ROYGBIV is a bit too much for you, you could still do multicolored dresses like in this lovely wedding. As a side note, we love that the bride wore a floral print dress! There are lots of ways you could incorporate this trend in a more subtle way too – have each of your bridesmaids wear a different colored sash or carry a different colored bouquet, etc. 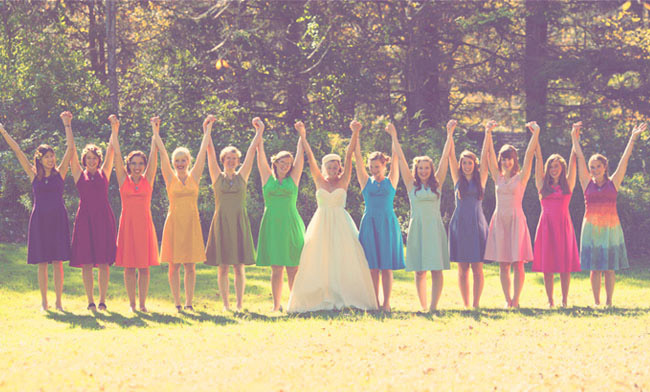 The rainbow bridesmaid dresses are bright. Stunning bridesmaid dresses. My friend is getting married and is in love with the dresses that each man is wearing a a different color suspender and the girls have rainbow eyeshadow. Can someone PLEASE let me know where we can find dresses like this? I love the rainbow make-up above and the whole look is great!Thank you for inspiration! omg it’s really ridiculously CUTE! They were fantastic. 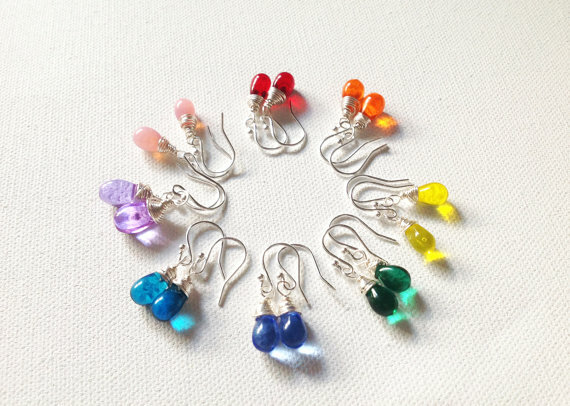 I love rainbow colors because it makes your day lively. Perfect theme for bridesmaid dresses. What does ROYGBIV stand for? I think I love the first one best. It’s beautiful. I LOVE the colored suspenders too- so sweet! Love this-the look is just so fun and happy! I love the color – such a fun and bold statement. 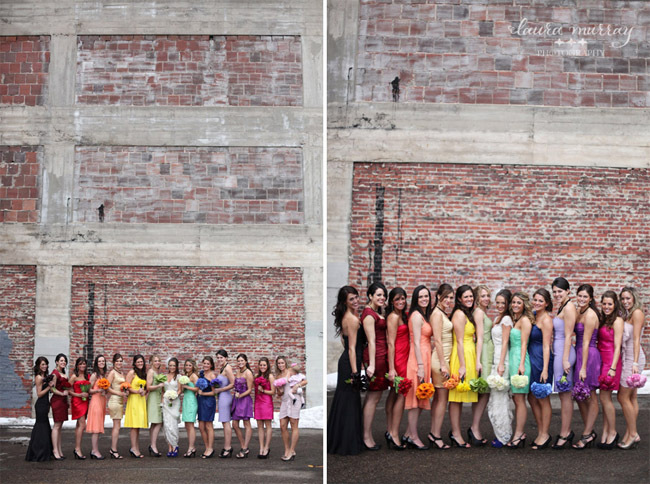 The brick wall is a fantastic backdrop for such colorful dresses… makes the color pop! I love this idea!! Beautiful!! 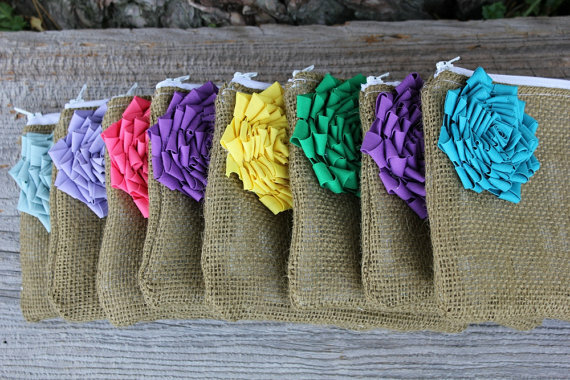 This is such a great way to inject your bridesmaids personalities into their outifts! I am completely smitten with this idea. It’s just so bright and beautiful and I would be a happy bunny indeed if one of my brides wanted multi coloured bridesmaid dresses.